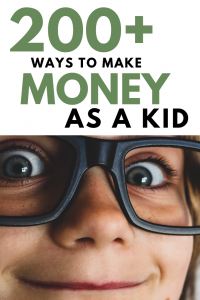 Just because you’re a kid, it doesn’t mean you can’t make some cash while you’re not in school. And whether you’re,11, 12, 13, 14 or even close to 18 years old, there are SO MANY ways to make money, both at home and outside. Now, be forewarned that there are so many ways to make money, this guide you’re about to read it probably one of the largest on the web. And no, you don’t have to spend a penny to read it nor do you have to give me your e-mail address. I don’t work like that here! Just browse and jot down the ones you like, it’s simple as that. Lastly, I know some may sound great, but some may sound dumb. I did a lot of research and included almost everything I found that could cater to aany kid and make you some money. Just remember that if it isn’t of interest to you, it may be of interest to someone else! 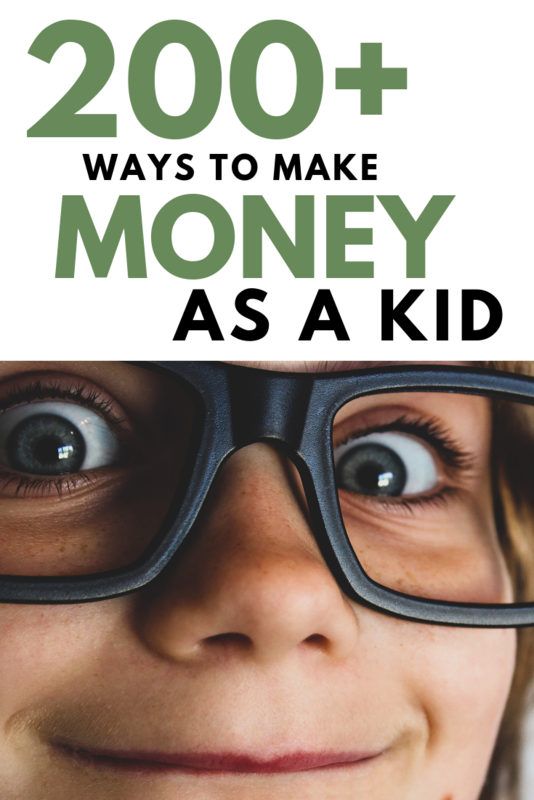 Without further ado, let’s dive in and talk about the HUNDREDS of scam-free ways you can start making money as a kid right now. This is probably the easiest way to start making cash right now online as long as you’re 13 years old and reside in the United States. I like it so much, I’m actually a member and wrote a detailed review you can find here. Simply put, Survey Junkie works with hundreds of research companies and needs your opinion, where you will answer simple questionnaires that take no longer than 5 to 20 minutes to complete. Honestly, every day I can answer at least 5-10 surveys and make about $3~, sometimes more. That adds up to close to $90 a month. Yes, it’s as simple as it sounds. Just answer questions and make money. If you’re active enough, you could make $50+ a month, easy. Yes, Swagbucks is promoted all over the Internet, I know, but it is for a good reason — there are a TONS of ways to make money with Swagbucks. From answering questions, just like Survey Junkie, to watching videos and playing games, Swagbucks offers a ton of new opportunities almost daily. You won’t be bored, let’s put it at that. And if you don’t believe me, check out the popular subreddit, /r/beermoney and browse the income reports. Some people make more than $200+ a month at 13 years old. Swagbucks is 100% free to join, but you do need to be at least 13 to activate your account. Much like Swagbucks, CashCrate works in almost the same way as Swagbucks, but I wouldn’t say they are as big. However, in the world of making cash, it’s best to add as many of these websites as possible, right? At CashCrate, you can earn money taking surveys, watching videos, referring your friends and even playing games. You must be 13 years to join, and again, it’s 100% free. If you like the idea of answering questions in your home, then, yes, there are even more companies you can sign up for, but you need to be at least 13 years to join and reside in the United States. Just make sure you read the terms and conditions before signing up, however, to be certain as you may need parental consent in most cases. Most of the companies I list below work in the same way and is a fantastic way to earn $25+ a month, all while in the comfort of your own home. Create a profile, make it a habit to check in daily and try to answer as many questions as you can. All are 100% free, scam-free and require no up-front investment. Plus, you can do it anywhere you have internet access, making it a very flexible way to make money without any commitments. Hey, you’re on this website right now, and guess what? It makes me some money. Albeit it’s not a lot right now (maybe in the future), it’s money nonetheless. And while you will need hosting (Hostgator starts at $2.75/mo, for instance, and I have no issues with them) and a domain name (NameCheap starts at $0.88), there’s really no other business where you can invest as little as $10 to get started to potentially make a full-time living. Starting the website isn’t all that hard to set up as all you will need is, as mentioned, is a hosting plan, a domain name, an installed WordPress CMS (this is free) and I recommend a keyword research tool to know what you should write about. This can be a whole another post in itself, trust me, and I do plan on linking to it in the near future, but for now, there are a TON of great free resources online as well as some fantastic low-cost website courses on Udemy for a few dollars. Buy a course or search for ways to make money with a blog to get started. With the right marketing skills, the right website and a lot of work on your end, it could make you hundreds, thousands or maybe even MILLIONS. Out of all of these on this list, it’s one of my favorites for a few reasons. Your opportunities are endless, it’s passive and you can have fun writing about something you’re passionate about. However, don’t just read. Take action and see what works for you. Don’t like the idea of starting a website? That’s okay, too, as there are A TON of other ways to make some cash online, including YouTube. For the price of a nice camera (about $100+), you could be well on your way to your first video, making it yet another very low-cost business venture. While it may be your dream to become a YouTube star, anything is possible, but do keep in mind that it could take some work before your subscription base starts to grow. Yes, even the biggest YouTube stars had to wait years before they saw success. Creating a video channel will take research, you will have to find a niche, and most importantly of all, you need to offer something UNIQUE. I do plan on writing a post about YouTube in the future once I try to master it, but for now, there are experts online and even on these Udemy courses that can do a much better job teaching you than I can. I can almost guarantee you that there are families who need babysitters right now for their upcoming date night on Friday or for a few days in the afternoon while you’re on summer break. And while babysitting won’t make you rich, a lot of teens say it’s one of the easiest ways to make cash. After all, you’re playing with little kids, doing what they want to do, such as play video games and eat snacks. While finding a babysitting job could be hard at first, your schedule could be packed once you prove your worth. Honestly, just show up on time and have some fun. To find a job, I recommend you join Care.com (must be 14+) to find people who need help in your area or take a look at SitterCity.com, a local Facebook Group or just asking around the neighborhood. There could be a good chance your parents know of somebody who needs the help. Also, as a tip, to be more marketable, I do recommend you become CPR certified, all of which you can do online via companies such as the American Health Care Academy. Prove yourself and parents will be knocking on your door before you know it. Quite possibly one of the easiest ways to get started and make money fast, it’s not that hard to find people who need their lawns cut. And just requiring a lawn mower (maybe borrow from your parents?) and some gasoline, this is an awesome way to make $25+ a cut. Throw some flyers in your neighbor’s door and see who wants your service. As a fair warning, if you’re good enough, you may have too much work to handle. Even if you have a few dollars, flipping items could be an awesome way to earn a few bucks every week. Referred to as retail arbitrage, let me explain how it works. Your goal is to find something that’s priced extremely low. This could be an item on the clearance rack at Walmart, an old book at Goodwill or a video game at a garage sale. I think you get the point, right? You need to find an item somebody wants for a low price that you feel you can make a profit with. Then, when you find an item that you think can sell for a profit (there are tools you can use to help), you will turn around and sell it on a selling platform of your choice, such as eBay, Amazon, Facebook, etc. Of course, there’s A LOT more to it than this, but if you want to learn more about the process, I do recommend a few of these retail arbitrage videos on Udemy to teach you in depth how to make money in doing so. Check out the great flipping subreddit as well. Invest a few dollars and I can promise you that you can make it back if you implement the tips mentioned in the lesson. Don’t have the money to flip items that cost money? That’s fine as you could browse the Craigslist freebies section or even local Facebook groups to see if there are any freebies you could sell for a profit. Heck, even walk around your neighborhood on garbage day and see what people are throwing out. From re-finishing old furniture to fixing a lawn mower that no longer works, you may be surprised what people are giving away for nothing. IF considering this route, do keep in mind that it is VERY competitive and you will need to act fast if you see a freebie of interest. I won’t go into too much detail here as it involves it a lot more than I can explain here. But in short, here’s how it works. Find items on sale at a local retailer as well as a coupon that you can use on top of the sale to make the item almost or even free. Let’s say, for example, a candy bar is on sale for $0.50 and you have a $0.50 off coupon, making it free. In this particular case, you could take the candy bar and sell it at school and make a quick $1. Most of these coupons can be found online, but in some circumstances, you may need to get a newspaper. But don’t worry, it isn’t much work as awesome websites like theKrazyCouponLady.com does the dirty work for you, showing you exactly what you can buy for next to nothing as well as what coupons you need. Also, you can check out my top 50 favorite coupon websites as well if you’re really interested. With these newfound freebies, you can then turn around and sell them for a nice little profit. Touching on the babysitting idea, consider creating a kids camp in the comfort of your own (with your parent’s permission, of course) and invite a few families so that the parents can enjoy a date night. Just like babysitting, it can work in a similar way, only that you will have a much bigger audience to entertain. Create games, set up fun zones and watch the time fly, all while making a few bucks watching a few kids at once. If the parents like it enough, you could consider turning it into a recurring weekend getaway, ensuring it an almost consistent paycheck each week. This is kind of like babysitting, but instead, the parent will be home, more than likely the mom. And as the name states, you will just be the assistant for the day, helping the mom with whatever she needs help with. For example, this could include prepping a lunch, vacuuming the floors, cleaning up the toys, etc. The list is endless, but if you don’t mind helping someone out, it could be a nice opportunity for a recurring job. This one is kind of geared toward those who can drive, but if you live in a town with a few amenities nearby and are allowed to walk or there, then it could work for you as well. From buying a few groceries to dropping off mail, an errand runner, much like a mom’s assistant, will work in the same way, only that you will run the errands outside of the home instead. I’ve had this free app for a while and it appears it is available to those older than 13. And much like the lottery, the free Lucky Day app works in the same way, only that you DON’T have to pay for your lotto ticket. Check in daily, scratch off your scratchers and earn points and even real cash. Don’t expect much with this app, but I average about $10 a month playing almost daily. If you want, you can use my referral code — IFW7MNQ — if you plan on joining. Like the Lucky Day app mentioned above, there are other apps highly recommended in the money world that can make you some money, but in all honesty, I haven’t tried most of them, so I’m just basing them off the good reviews. From my research, all of these apps are free to download, but again, like the surveys mentioned prior, do read the terms and conditions to know for certain as you may need parental consent. Just like babysitting, pet sitting can be a great way to earn cash, especially if you love mingling with dogs and cats. Whether it’s checking in someone’s cat once a day while they are on vacation or taking the dog out for a walk three times a day, people need somebody to watch their pet and they are willing to pay for it, sometimes up to $50+ per day. Check with your neighbors, post flyers around the neighborhood or even ask your parents to post an ad in a local Facebook group. If your parents let you, you may want to have them help you create an advertisement on Rover or Care.com to expand your reach. Adding to the pet sitting section, dog grooming is yet another MASSIVE industry where you can make some nice money bathing and grooming dogs. And to do so, it’s not as hard as you think. Grab a hose, purchase some specialized dog soap and go to town. Here’s a great YouTube video is you need the help. Yes, it’s a nasty job but somebody has to do it. And since a dog needs to do their business every day, it’s a great way to keep coming back for more cash. To get started, all you need is a good pooper scooper ($10 to $15) and some small garbage bags. As the pet theme continues here, dog walking kind of intertwines with the dog sitting, but it won’t be as much of a responsibility since you’re just responsible for walking the dog and nothing else. And the thing I like about dog walking is that it could be an awesome recurring payment since they probably will need to be walked every day, meaning an almost daily payment for your services. If you like all of the pet ideas so far, consider combining your services, offering all of them to see what dog owners may want to use you for. Have a lot of junk laying around that no longer need or want? Well, there’s a good chance you’re sitting on a few extra dollars, especially if it’s some sort of electronic, a book or even Lego set. Whether it’s asking for permission to hold a garage sale or getting an instant quote on Decluttr or Amazon, you may be surprised as to how much you could sell your items for if you no longer need them right now. Ever get a gift card that didn’t want for Christmas or your birthday? Well, instead of worrying about scammers on eBay or buying something you don’t want, did you know that companies are willing to buy them off you for close to face value? Yes, you don’t have to deal with the public as these companies do the direty work for you. Raise.com, Cardpool and even Giftcardgranny.com are a few of the many websites out there right now that are willing to give you a quote right now for just about any gift card in your wallet. Who says you need to be a school to make money in regards to fundraising? If you have the entrepreneurial spirit, then consider purchasing items designed for fundraising and turning around to sell it for a profit. This fundraiser could be for your future college fund, school supplies or for an upcoming class trip. It’s up to you to be creative as to how you want to promote and sell your goods. And, as long as you have valid reasoning as to why you need to raise money, then people will be more than happy to contribute to your cause, especially if you have a good item they want to buy. Fundraising can be a great way to make money as you only have to focus on one thing — selling. If you’re good enough, there’s no reason you can’t see a 40%+ profit margin! I saw people doing this in my neighborhood, wherein they would place flyers in my door, letting me know that they would be in the area in the upcoming weeks if I wanted my address painted on my curb. A simple job to do, painting numbers can be lucrative, but you just want to make sure it’s legal in your area before doing so. You don’t want to break any laws, right? If so, stencils and the spray paint will cost you less than $20 in most cases but can easily be recouped during your first job since most kids charge $20 to $25 per job. To see the job in action, I encourage you to watch this YouTube video. Live in a climate with snow? You have no idea how many people will pay you to shovel their driveway. Just be prepared when the snow comes falling! House cleaning is an amazing way to earn some extra cash, and I mean EXTRA cash. With some homeowners paying more than $250+ a visit, this is where you can come in and offer your services for half the cost. Recruit a friend, clean your butts off and earn enough to hopefully earn enough to pay off your future college degree. Of course, cleaning is hard work, but it doesn’t require much in terms of startup costs. And if you’re serious, here’s a great checklist you may want to download to ensure you don’t miss a spot in the home. Touching upon the house cleaning tip mentioned prior, let’s talk about the many ways you can earn even more outside of the basic cleaning homeowners expect when they hire you. With tile in a lot of home, it gets dirty, and it gets dirty QUICK. And since it’s an eyesore to most, this is where you can come in and create an all new looking tile. Plus, let’s not forget most people don’t want to invest their time doing this job. Now, I will warn you. Cleaning grout is a LOT of work and may not be worth the cash to you, but if you think you have it what it takes, then by all means, consider it as an opportunity! If interested, there are some great kits on Amazon with hundreds of five-star reviews that will get the job done. Carpets need to be cleaned every six months, and if you have access to one, it could be a great way to make $100+ for the afternoon. And if you don’t have access to one, don’t worry as you can consider renting one from a local retailer or even investing in one if you feel your business can take off. From one room to the entire house, you may be surprised as to how many people will want their carpets cleaned. Yes, I know. It’s cliche, but I need to include it here just in case you didn’t think of it. Whether it’s at the end of your driveway or near a hot event, it could be a lucrative hustle if you’re in the right spot. And if your parents are willing to help, see if you can get a temporary permit for an upcoming festival, parade or any other event that draws in a lot of people and lug around a cooler on wheels selling cold drinks. No matter where you live, there’s a good chance there are homeowners with some fruit trees on their property. Using your entrepreneurial spirit, contact a few of these homeowners to see if they are willing to give you any excess fruit they don’t need, and in exchange, you can turn and sell it for a profit. This can be a win-win for both parties as you get paid and the homeowners don’t have to worry about all of the fruit falling to the ground, leaving a mess later. You could also consider visiting a U-sell farm and turning around to sell your pickings for a profit. I love this idea for a few reasons. For one, you barely have to do anything. You simply sit in a house and make sure everything is working as is. Maybe from time to time, you have to water a plant or get the mail. And secondly, you get paid! Whether it’s actually staying at the home while the homeowners are away for vacation or simply checking in, homeowners are willing to pay a few extra dollars to ensure their house is in working order when they come back. Easier said than done, I know, but if you have a product idea but don’t have the funding to get started, then consider starting a fundraiser on websites like Indigogo or Kickstarter. In this way, you can talk about the product you want to create, and if the people like what they see, they will send you money so that you could eventually start the project. One guy made $55,000 for potato salad, so the idea doesn’t need to be truly unique. Then, if you do raise enough money, your dreams could become a reality. Do keep in mind, however, that these platforms are extremely competitive so make sure your idea is something of value. While it does take a pinch of learning, I did find quite a few highly rated books you may want to check out if you’re interested in crowdsourcing. If you like the idea of a part-time job, where you can work five, 10 or even 20+ hours a week, consider checking Snagajob.com, one of the Internet’s largest job board for hourly workers. And if you follow this link, it will directly take you to the current teenager jobs, allowing you to see who’s hiring in your area. Now, depending on your age, some of these companies may hire at 14 years old, but in most cases, you will probably have to be 16 years or older. It doesn’t hurt to look, however! Elderly people need a lot of help, whether it’s getting the mail, helping around the house or even cleaning up a yard. And if you know of someone who may need your help in your neighborhood, don’t be shy as most will be more than happy to take advantage of your help. Even if you don’t know of anybody, there could be a senior center nearby that needs your help. With Perk.TV, the company pays you to watch short clips on their website, all available in various categories, from sports to recent news stories. You won’t make much in doing this, but it could be a great way to earn some cash while passing time if you like watching videos online. Whether it’s knitting a newborn baby quilt or a scarf, turn your crafty skills into a recurring paycheck. In today’s world, it’s easier than ever to sell your crafts online and even in person. From creating a storefront on Etsy to opening a booth at local craft shows or a farmers market, the options are out there. If you’re shaking your head, thinking you can’t do it, it’s time to think again. YouTube, Udemy and thousands of websites out there offer a million ideas and guides to get you started. If you have sewing skills, then you have additional options as well. From touching up some older clothing to make doll clothes, check out Pinterest for thousands of ideas as to what’s hot right now in the sewing world. Check with your local laws before considering this option, but if you feel you can cook a great brownie or batch of cookies, you may want to take your talents to the local farmers market or sell via a roadside stand. Become good enough and you could consider running an online business to ship direct. For the older kids, consider meal prepping for busy families. Research some freezer prep meals online, master a few and offer your services to families that could use your help. A great idea for those who enjoy cooking, you can feel good knowing someone doesn’t have to eat out with your services. Touching upon the crafty idea, jewelry can be just as lucrative on websites such as Esty. From soldering to beads, there’s a wide variety of designs to consider. And again, if you like the idea, but have NO idea as to where to start, Amazon has a ton of books on the topic that can get you started. In the t-shirt business, you don’t need to need to even have inventory nowadays if you want to sell online. Instead, all it takes on your part is the graphical design and marketing skills to make your first dollar. And while selling t-shirts online can be a challenge, just like a lot of these selling options, it can be done. In fact, some people report making $150,000 in doing so. Selling t-shirts can be very lucrative, but I do recommend you learn the industry before jumping in. Whether it’s taking a class on Udemy for a few dollars or reading free resources online, figure out what works before wasting your time. Have a knack for design? If you’re good with photoshop, either with creating graphics and/or editing photos, then there are thousands of people out there who need your services. And even if you’re not, there are some amazing courses that can teach you from scratch. To start, I highly recommend you begin with Fiverr as your platform to test the waters in the graphic designer world. YouTube is HUGE, and yes, I already mentioned it, but you have to realize that there are a lot of people out there who need help with their video editing. Some people don’t have the time, while some people just don’t know how to use the right movie editing software. And this is where you can come in. Like graphic design or any freelancing jobs, Fiverr is a good place to start selling your services, but there are many more platforms to consider if you want to bid on more jobs. If you don’t know how to edit and you like the idea, again, there are a lot of courses, books and even free resources online that can get you started. I promote Udemy a lot on this website, and if you’re unfamiliar with the platform, it’s basically a classroom online where anyone can teach anything. Honestly, you can find a class on ANYTHING. Most of these courses are very inexpensive, and the great thing about is that you can actually become an instructor and teach something you love. Again, it can be ANYTHING. While it could take some time to build your courses as you would need to videotape yourself, it could be a great way to earn a passive income seeing that once you’re done the filming, it could make you money for a long time. It is free to create a course, but like most platforms, they do take fees out of your final sale, all of which can be seen here. A lot like teaching a course, considering tutoring others as well, especially if you’re doing very well in a particular school subject. This could include music, math, writing, reading, science or even a foreign language. If you’re good at it, someone else may want to learn from you, so it’s something to think about! Good with an instrument and you’re not afraid of the public? Consider setting up an act in a populated area and start playing for tips. Can you play on your own? Could you get a band together? If so, you may be able to play local events or even parties and charge a small fee. Learn some popular cover songs and start reaching out to local farmers markets, street fairs and individuals to gather interest. Of course, you’re going to have to be good, but it could be a fun way to make money. Use your knowledge of cell phones, TVs and the Internet to help others set up their gadgets, teach them how to use or show them the tips you know to help maximize their experience. From helping senior citizens to adults, start a class or offer private help/lessons, teaching them everything they want to know about the wonderful world of tech. I wrote about the many ways to make money with your photos in my 500+ ways to make money guide and will include it here as well. If you’re a fan of taking photos, did you know you can upload them to a variety of websites and make cash in doing so? While people do have to buy your photos, it could be a great way to turn your hobby into a lucrative side job. All of these websites work in a different way, so just make sure you read the terms and conditions before creating an account. In some cases, you may need your parent’s permission to open an account to start selling. Touching upon the photo tip, there are a lot of people out there who have pictures that aren’t online, and since it’s a good idea to always have a backup, this is where you can come in. 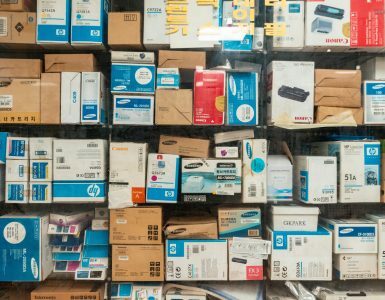 A picture scanner can cost more than $100, but if you can charge by the photo, this investment can pay itself off relatively quickly, I promise you that. Much like digitalizing pictures, people still need to convert their VHS to either a DVD and/or digital movie file. AND, it’s not that hard to do. A digital converter costs less than $15, and as long as you have a VCR and computer, you’re good to go! Your classmates more than likely have some money on them and this is where your entrepreneurial spirit can shine. From selling candy bars to small pieces of jewelry, I have read countless stories of students making a few bucks in doing so. Get good enough and people will know to come to you whenever they need some of your goods. Freelancing isn’t only for adults as you can do it online as well as long as you have your parents permission. In the world of freelancing, I highly encourage you to check out Fiverr and take a glance at the most popular gigs to see what sells. If you think you could offer a similar service, consider creating your own listing and building your client base. As with most of these options, it could take some time, but if your work is good enough, word will spread and you could find yourself with much more work than you know what to do with. 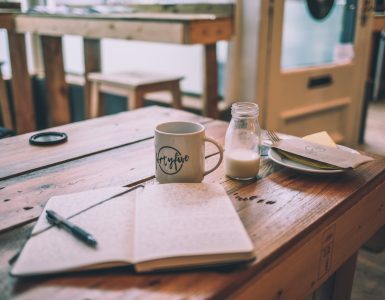 And aside from Fiverr, there are so many other freelancing websites online, most of which I cover in this exclusive make money guide. I know you may be just a kid if you’re watching this, but can you fix anything around the house? Even if it’s something as simple as putting together a desk or even fixing a hole in the wall, think about it for a second. If you know you’re good at something, be sure to promote yourself as someone may need your skills. Start a car wash in your driveway in the summer months to make a few extra dollars. Take it one step further and offer to clean and vacuum the interior to make even more. Just like cars, boat owners need their boat interior and exterior cleaned, so it doesn’t hurt to check with a nearby marina for information. In fact, some may even hire you on part-time if you’re good enough! Take it one step further and clean out one of the biggest vehicles on the road — an RV. Yes, while it could take much longer to do, your paycheck could be 10 times more of that in compared to a simple car. Continuing the washing theme, some people may need their furniture cleaned, often with a spot cleaner., even on a regular basis. Most commonly needed in pet and little kid homes, it may be a good idea to target this demographic for great success. Thinking outside of the box, I found this opportunity when searching online and it could be something of interest if you like working with your hands. And no, you don’t need a lot of skills, only a book repair kit, all of which won’t cost you more than $20. Just follow these tutorials, find someone who needs their books fixed and make a few dollars in doing so. So many youth sports leagues in your area are probably in desperate need of referees, and the great thing is that most ask that you’re at least 14 years old. Consider talking with your local parks and recreation department and/or look up leagues online for more information. Good with computers or any electronics in general? Then, consider offering your services to others. From virus removal to upgrading hardware, there’s a world of services available in the PC/electronics world and finding the help shouldn’t be hard if you promote yourself for an aggressive price. Programming is the future, and you’re NEVER too young to start learning. From designing websites to creating apps and even teaching others once you get good enough, there’s a lot of money in this field. And since a lot of people don’t want to take the time to learn about it, this is where you can take the time right now to master the art. Master it and companies will start knocking on your door for a high-paying job. Take low-cost courses on Udemy, purchase some books on Amazon or even code for free at CodeCademy. As a kid, you probably have SOMETHING that others may want to rent out for the day, week or even month. From a video game you never play anymore to maybe even a video game console while you’re away on vacation, consider talking with friends, neighbors or schoolmates, you may be able to make a few dollars in doing so. Just be careful, however, as you will want to draw up a simple contract to ensure you get your items back. Every home has windows and regardless of where you live, these windows are going to get dirty. For about $25, you can purchase both a squeegee and the necessary cleaner to get the ball rolling. Going door to door in your neighborhood is a great place to start, and since these windows will get dirty yet again, you could have customers calling you back every year. A lot of businesses want to spread the word and one effective way is in lieu of door hangers which you simply hang on a door. Reach out to businesses or even look for gig opportunities on Craiglist if you don’t mind walking a few neighborhoods. Know of someone who’s either not home or an elderly neighbor who may need help with their garden? A garden needs a lot of work, so offer your services to help water, pick weeds or even harvest some of the crops. Touching upon gardening, this is sort of the same idea, but instead, solely focuses on watering plants around the home, inside and out. Since plants, of course, need water to survive, there may come a time you could come in to help water both indoor and outdoor plants to keep them growing while someone is away. Outside of the garden, you’re probably already fully aware that weeds pop up EVERYWHERE. From rocks to the lawn, picking weeds is tedious, but people don’t want to do it, so this is where you can come in to offer your services. No supplies are needed, expect your hands, and you could start right now as long as the weeds are growing. Not too many love to rake and bag leaves in their yard, but if you don’t mind working outdoors for a few hours, this is one of the best ways to make money as a kid. And to find a potential customer, it’s not that hard! Spot the yard with the most leaves, offer your services and see if they bite. Best of all, you only need a rake and a few bags, all of which cost less than $30. Worst case, you can always borrow one from your parents or the homeowner. Like the lawn and garden, bushes and trees need attention as well. And as long as the trees aren’t too tall, you could take advantage of trimming and maintaining the foliage in someone’s yard. Combine all of the abovementioned landscaping ideas and you could have a mini landscaping service going. People are always purchasing new plants for their yard, and while most of us plant them ourselves, some need help or just don’t have the time. Whether you want to help purchase the plants and plant them yourself or help an elderly neighbor who’s having a hard time doing so, there could be an opportunity here. This could be dangerous, so be careful if you’re afraid of heights. Plus, since you’re probably not insured, a lot of homeowners may be hesitant hiring a kid to do this work. Regardless, it’s something I want to throw out there as it needs to be done during the fall months and could be a nice option for a smaller-sized home. Combining all of the landscaping strategies already mentioned, you can combine a few of the services and offering a recurring package. If your parents allow it, see if you can raise some chickens and sell the eggs, but before you do so, just make sure owning chickens is legal in your town. If you have the land and your parents let you start a garden, growing one could pay off great dividends, regardless of what you grow. Setup a roadside stand, sell at a local farmers market or post an ad online once your produce comes in. People love fresh produce and will keep coming back for more. Farmers are always looking for help on their farm and could be a good opportunity if you live near a few. From feeding the animals to cleaning out the stalls, there are so many chores that need to be done daily, a part you can play. Reach out to some local farmers and offer your services to see if any need help. Touching on the farm, contact a horse stable, which operates in a similar way to a farm. Here, chores can include cleaning out the stables, brushing the horses or even horse sitting while the owners are away. Even if you live in the city, there could be a good chance a horse stable is nearby. During the holiday months, help homeowners hang decorations and lights. In doing so, you can help create a very festive neighborhood. From organizing a closet to a messy garage, there’s a market here if you don’t mind getting your hands dirty and making a room look like a room again. Consider targeting those with a messy garage (take a peek when the garage is open) or try some of the marketing strategies as mentioned prior. From wildflowers on public land to grow your own, who doesn’t like a bouquet of flowers? Just like a lemonade stand, consider selling at the end of your driveway or even attending a local farmers market for the afternoon. I have heard about this one before, particularly from those who live near a golf course. And if it sounds like something of interest, here’s how it can be done. In short, contact a local golf course and ask if you can roam the grounds after they close or before they open. Most of your smaller golf courses won’t have a problem with this as long as you don’t cause trouble. Then, once you’re in, comb the grounds, looking the woods, around the edges of the water or outside the boundaries near the fences on the other side. Golfers lose A TON of balls, so take advantage and resell them for a hefty profit. This is more of a hobby, but it could pay off big if you find a hidden gem. Buy a metal detector, visit a populated area, such as a nearby beach or park, and scanning the grounds for some goods to potentially resell. Of course, this probably won’t be a reliable income source, but it could be worth a shot to see what you can find. Honestly, painting isn’t that hard to do, but I’m not talking about getting a scaffolding out and painting a three-story home. 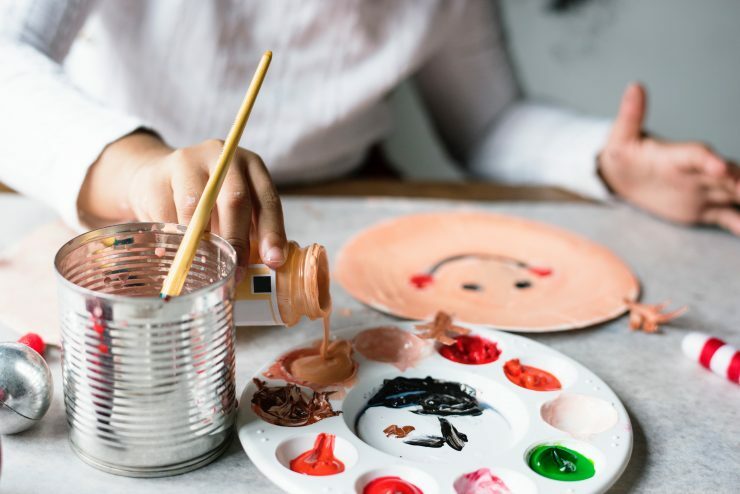 Instead, consider tackling the smaller paint jobs, such as painting a room, a fence, inside a garage, a small backyard deck or even attempt to restore furniture. As a kid, I wouldn’t try to tackle the larger jobs. It just isn’t worth it here. From power washing a deck to the home’s siding, power washing is a great way to clear out the cobwebs and make everything look like new again. And regardless of where you live, something will need to be cleaned. A good power washer will cost about $150~ if you wanted to buy one, but you may be able to rent one for much less for a day’s worth of jobs or even borrow one from your parents if at all possible. For the girls out there, painting nails and performing small manicures could be a nice way to make a few extra dollars, all while making someone feel special. Whether it’s at your home or in theirs, women are always looking to be pampered, so be sure to take advantage! Simply ask your parents if there are any chores around the house that you can do weekly for a small paycheck. Depending on your circumstances, your parents may be more than happy to delegate some tasks to earn you a few dollars a week. Pick up a shoe shine kit (less than $15) and find some shoes that need a quick shine. From a busy professional household to the average pair of shoes, everyone wears them, so why not take advantage? Every week, the garbage cans need to be placed on the curb, and believe it or not, but some people PAY others to do so. Find an entire block, charge a few dollars each and you could have $20+ in your pocket every week dragging garbage cans to and from the street. For the older kids who don’t mind chopping wood, you could gather, chop and/or wrap bundles to make some cash. Also, if you live near the woods and your family owns the property, see if you can chop and bundle up any of it to sell for a profit. If you can have your parents help you, collect metal or aluminum and return it to a nearby recycling center for some cash. If you don’t know where a recycling center is, use the iScrap App. And for those who are lucky enough to live in a state that offers a bottle deposit, this is a great way to make money as well. Check out parks, local construction sites (with permission, of course) and even trash cans to see if you can find any cans. In Michigan, for example, you can make $0.10 a bottle, which, as you can imagine, can add up quite fast! Selling spiders is profitable, so much so, one farm makes $25 each. If you feel you can breed them, then why not try selling the babies for a few extra dollars? Just like selling spiders for a profit, there’s money to be had in the cricket world as well, mostly for those with reptiles as pets. AND, it’s not as hard as you think. Refer to this great YouTube video to see how it can be done. Like the idea of raising animals or insects? Well, you’re in luck as there are additional ways to make money in this world, including rats, mice, hamsters and even worms. The great thing about this is that your setup doesn’t need to be too big and most animals can be sold for a nice profit. Know how to level up in a video game or help someone out? In exchange for your time, offer to do something in a video game for cash. Consider even selling accounts on eBay. Yes, people still subscribe to the paper and need help. If you live in a busy area where you could ride your bike, there could be an opportunity here. You won’t make money today, but I can promise you that your future self will thank you as you watch your investments grow. Think about it: If you invested $5 a month starting at 13 years old and did so until you were 70 years old, you would have close to $70,000 at 8%! Of course, you would want to invest more than this, but the power of compounding interest is the real deal and can make you quite wealthy, I promise. And even if you don’t have a ton of cash to invest, that’s okay as there are investment groups that allow you to buy a fraction of a share, simply meaning you only need about $5 to start. Check out Stash or even Stockpile to start saving today. Everyone wants to be an Instagram star, so what’s stopping you? Not the best option on this list, but if you like the idea of hustling online, it could be for you. 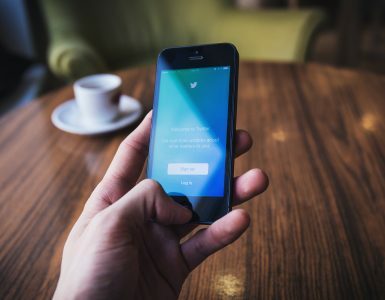 And since I don’t know much about the platform, there are some amazing courses on Udemy for a few dollars that teach you how to reach your first 10,000 followers! Money doesn’t come easy to anyone, it’s going to take work, but I know you can apply these strategies and start hustling today. Take a few of your favorites and take action right now because you’d be surprised at how many DON’T. As always, let me know how you made money as a kid if I missed any, and I will be happy to share them in this guide. In the meantime, get to work and let me know how much you made!